I was driving down to RHS Wisley Gardens on Thursday afternoon when I spotted this kestrel circling the field opposite Wisley Church. 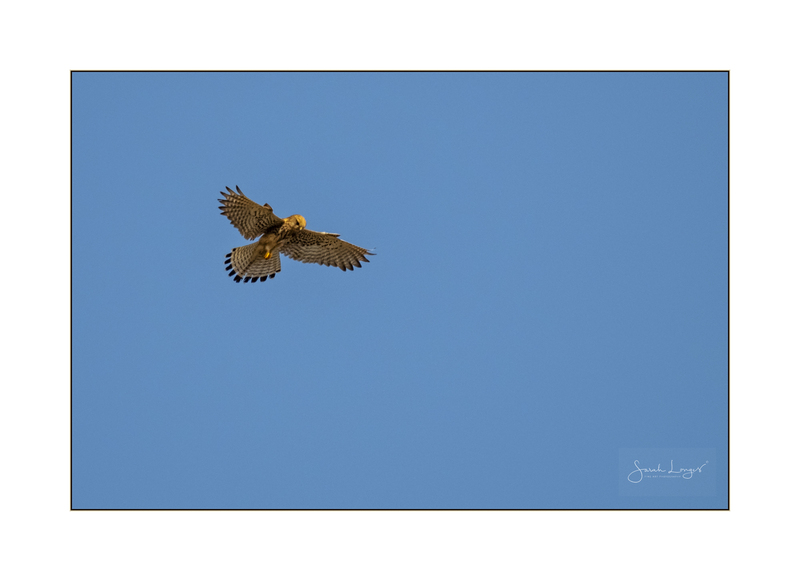 There’s a small lay-by that I pulled into as the kestrel approached. 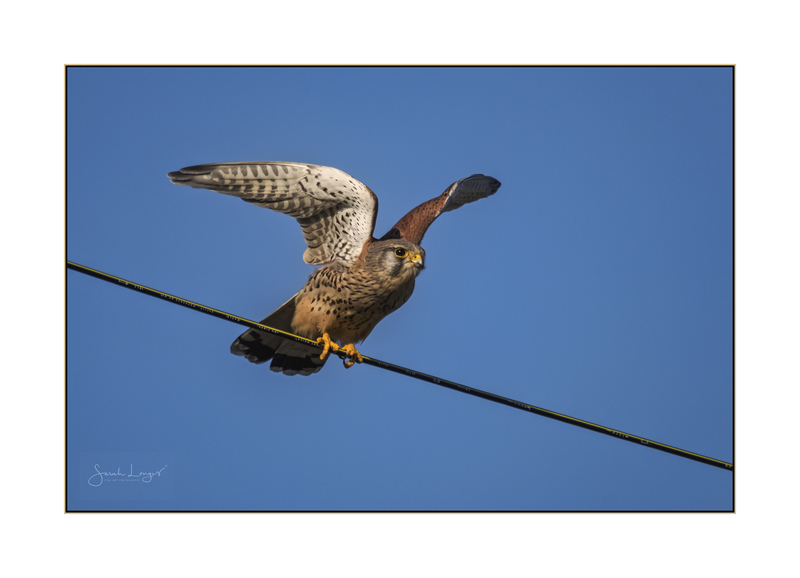 I was absolutely thrilled when it took a perch on the cables nearby! I didn’t want to spook it, so grabbed the long lens, wound down the passenger window and managed to get a few images as it surveyed the surroundings, before taking back off to resume the hunt. A magical moment! Often when I spot wildlife from the car there’s nowhere to pull over and be able to watch or photograph what I’ve seen. This has to be my ShareMondays moment and I will add it to the Wex Mondays challenge too. Have a great week everyone! A beautiful, male southern hawker dragonfly, fiercely protecting his territory, at RHS Wisley Gardens, in the warm sunshine yesterday. 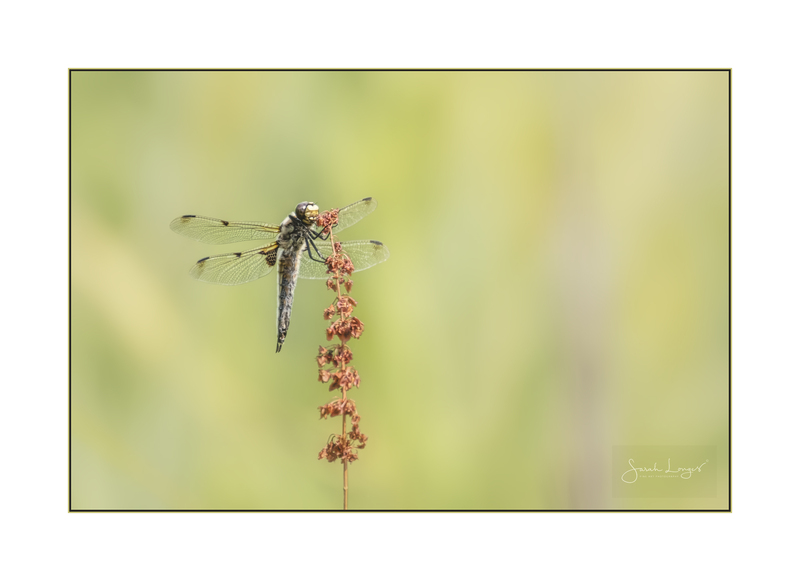 These hawkers are dragonflies of Autumn, seen into October and occasionally even November. I’m sharing this beauty for this week’s ShareMondays2018 and Fotospeed challenges. 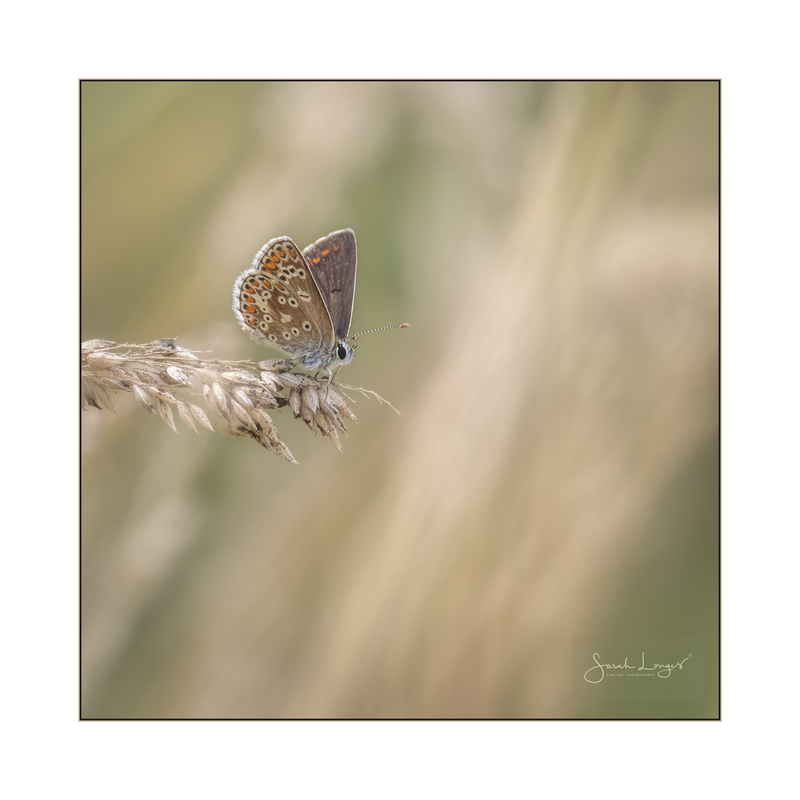 For ShareMondays and Wex Mondays this week is this perfect little brown argus butterfly in the grasses at RHS Wisley Gardens last week. This was the first time I have seen this species at Wisley, the first time I have been able to positively identify the sight of one in the UK and the first time I have photographed one! I was very excited. Then I realised that there were two! I almost did a little dance but my legs had seized up from trying to crouch. A great species to be able to add to my Big Butterfly Count this past week. 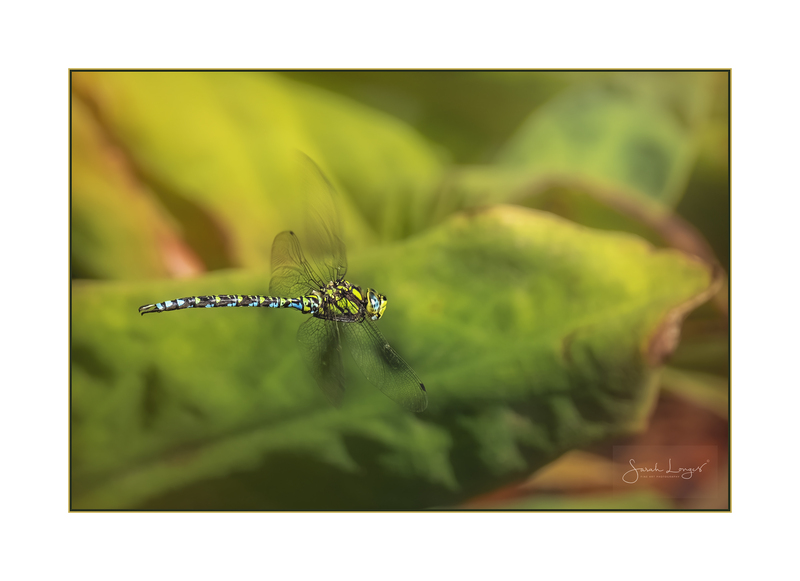 My specimen might be a bit tatty around his wings but these male emperor dragonflies are the real spitfires of the insect world, fighting hard and fast over their territory. He almost seems to be saluting me but I know that this behaviour is actually about cleaning and protecting those incredible and complex eyes! This close-up view was captured in the late afternoon last week, when the tired fliers start to roost in the reed beds. 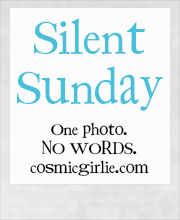 I’m putting this into the mix for this week’s Wex Mondays challenge. 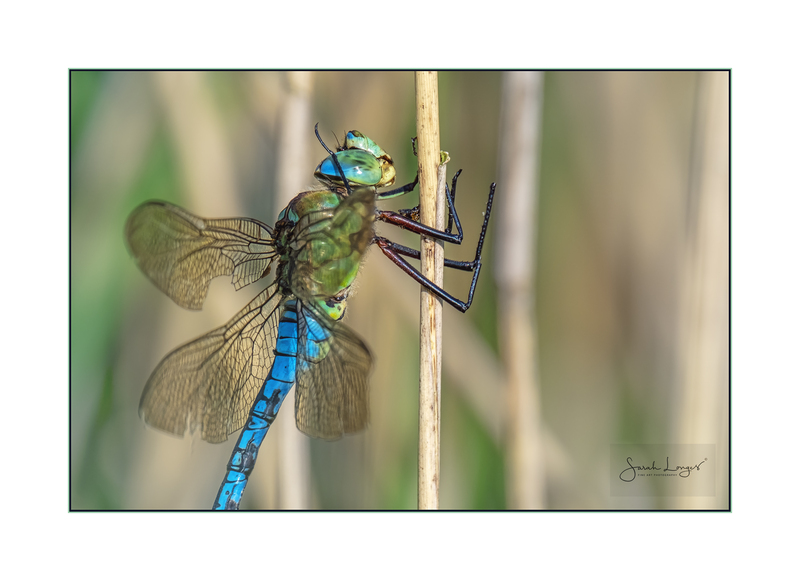 Downy Emerald Dragonflies are found mostly in the South of England. They’re on the wing now at Thursley Common National Nature Reserve. 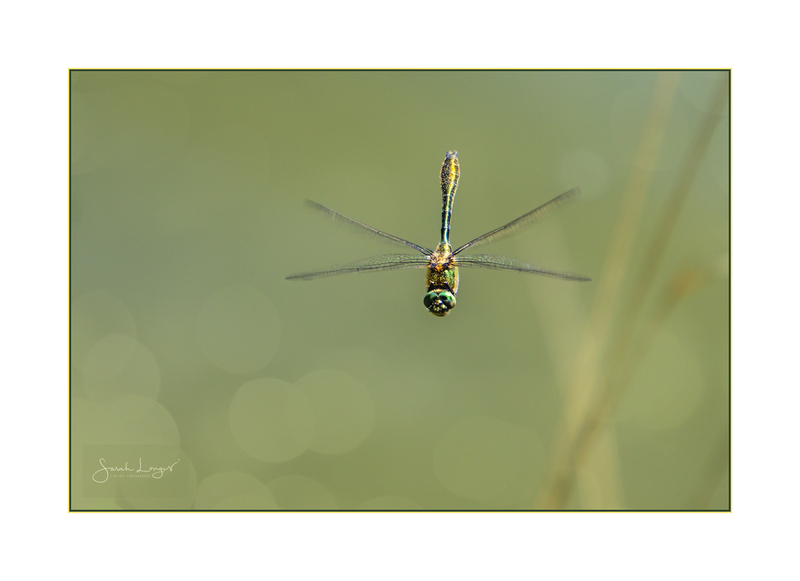 I was able to watch a number of them flying around the edge of The Moat Pond next to the reserve car park. 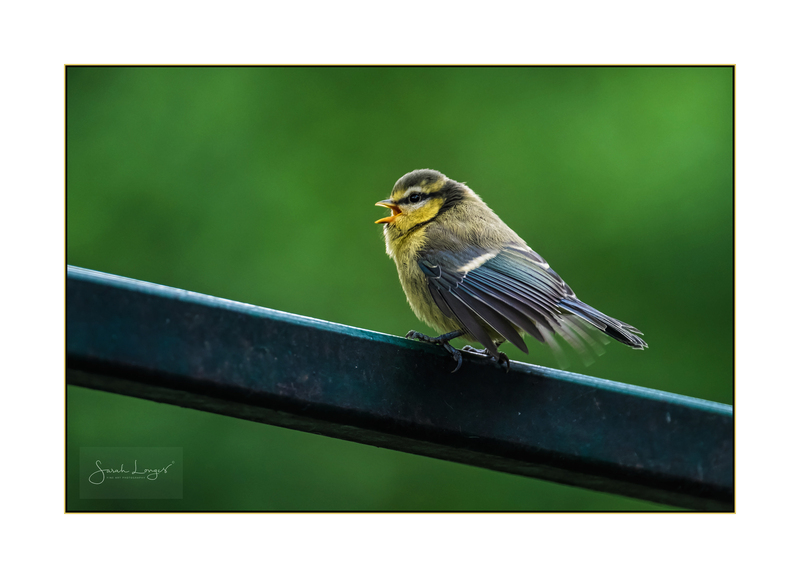 They’re very territorial and quite mesmerising to watch, darting about with the metallic greens and golds flashing in the sunlight! I’m sharing this image today for ShareMondays2018 and the Wex Mondays challenges. Good luck to everyone taking part! 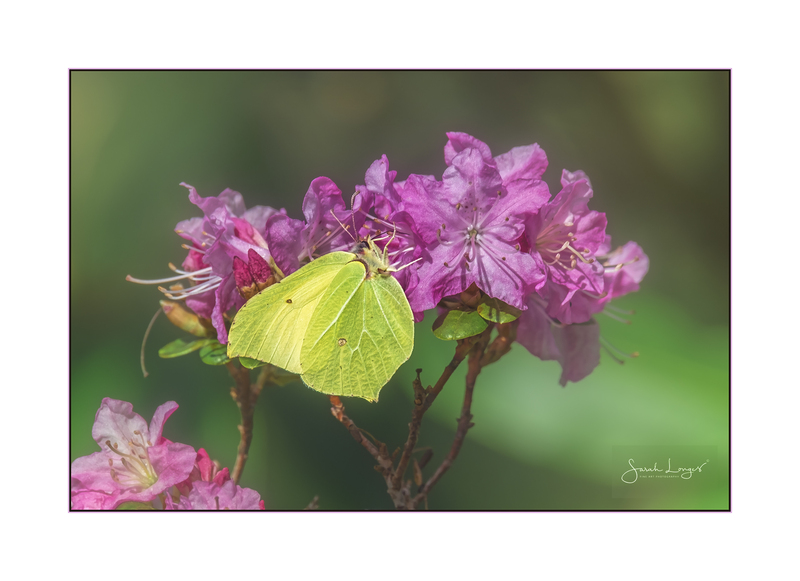 There’s nothing quite so wonderful as chasing Spring butterflies around on a warm, sunny day! 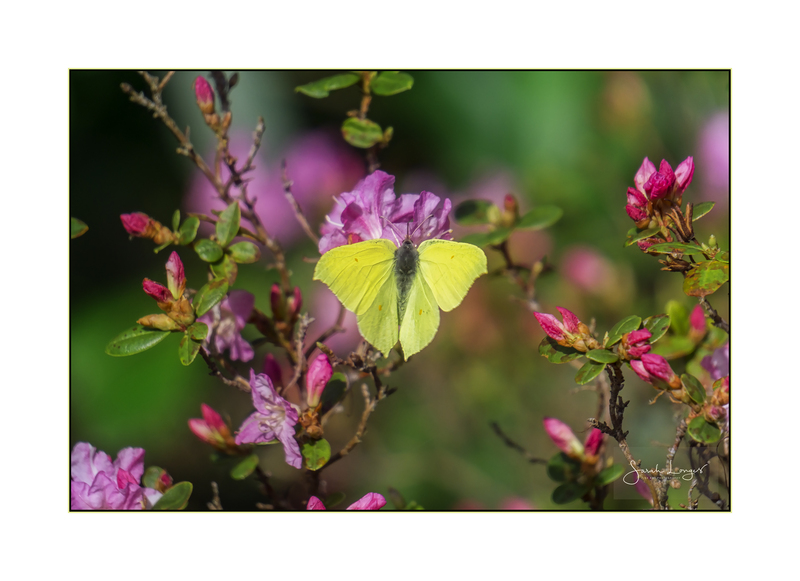 Brimestone butterflies were definitely in full bloom in the woodland last Friday. Seeing them dancing around the pink blooms of azalea was glorious and a perfect encounter to add into this week’s ShareMondays challenge. 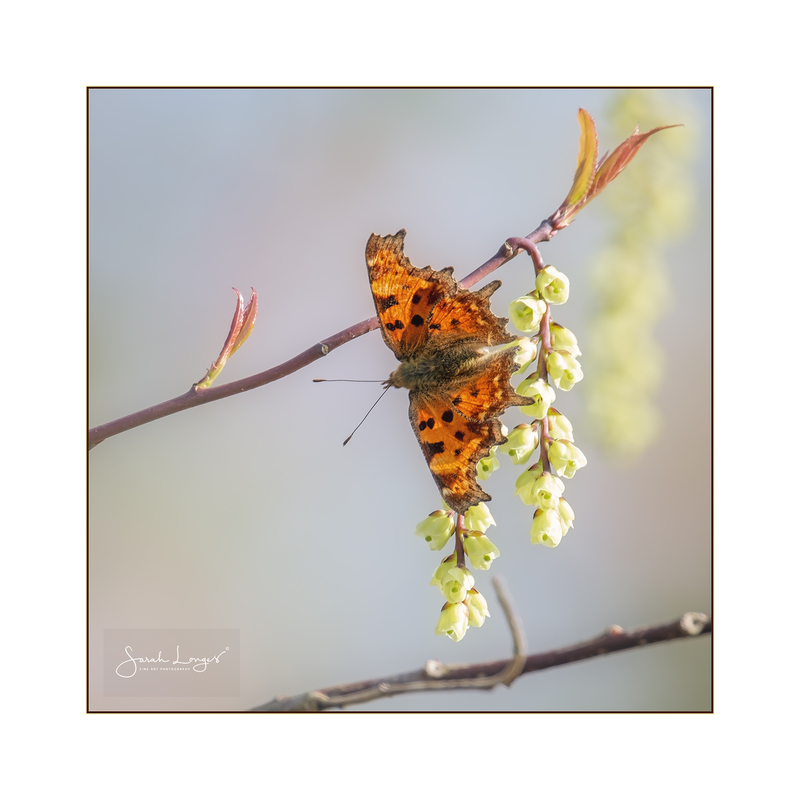 This comma butterfly really did make me pause to enjoy it’s beauty in the bright, Spring sunlight. The lighting brought those wings to life as it posed on the tree blossom on Battleston Hill at RHS Wisley Gardens. Such joy! I just have to share this perfect moment for Wex Mondays today. Good luck to everyone entering!